This item is 5 years and 7 months old; some content may no longer be current. A finding of anaemia on a full blood count is only the first step of a series of investigations for most patients. The mean red blood cell volume is used to classify anaemia into microcytic, normocytic or macrocytic, which helps to guide additional investigations. As most people with anaemia are asymptomatic or have non-specific symptoms, clinical examination usually only provides limited information. Clinical judgment, however, is an important part of the work-up as the cause of the anaemia and the likelihood of serious disease may differ between patients. The most frequent causes of anaemia in New Zealand are iron deficiency and anaemia of chronic disease. There are many potential causes of anaemia, the most frequent of which among people in New Zealand are iron deficiency due to blood loss and anaemia of chronic disease. Co-morbidities, medicine use and dietary deficiencies also need to be considered.3 Patients with features suggestive of a more serious underlying cause for anaemia usually require referral to a Clinical Haematologist or a Gastroenterologist for further investigation. The symptoms of anaemia depend on how rapidly the condition has developed.3 Clinical features may include pallor, tiredness, shortness of breath (particularly on exertion), cardiac symptoms (tachycardia, bounding pulses, systolic murmurs), fingernail changes, angular stomatitis and, depending on the underlying cause, jaundice. However, some people with severe anaemia that has developed slowly can adapt to low levels of haemoglobin with relatively few symptoms.3 Patients who have had an acute bleed are more likely to be symptomatic as they have not had time to compensate for the reduced haemoglobin levels. The adult reference range for MCV is 80 – 95 fL,3 although there is some debate about the cut-off for the upper limit of normal. Some references define macrocytic anaemia as > 100 fL. 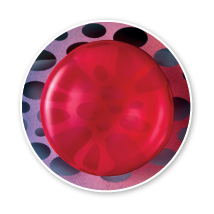 A red blood cell (RBC) is a small, highly deformable cell, without a nucleus. During its production (erythropoiesis) a developing RBC loses its nucleus, maximising the volume of haemoglobin it is able to contain. Erythropoiesis normally results in the daily replacement of 0.8 – 1% of circulating RBCs which have an average lifespan of 100 – 120 days.5 Erythropoiesis occurs in the bone marrow and is stimulated by the production of the hormone erythropoietin (EPO) which is released by the kidneys in response to reduced oxygen levels in the blood.5 Normally the process works at equilibrium, creating new cells at the rate of cell loss. However, it is elastic to demand, and erythropoiesis can increase four to five-fold when necessary, if iron levels and nutrition are adequate.5 If EPO production is deficient, e.g. in some patients with advanced chronic kidney disease (CKD), erythropoiesis stimulating medicines may be required. In a primary care setting in New Zealand, iron deficiency and chronic disease will be the most likely causes of microcytic anaemia. Thalassaemias are more common in certain ethnicities, such as in people of South-East Asian, Mediterranean or Pacific origin. The cause of iron deficiency anaemia always needs to be investigated. Ask about weight loss and gastrointestinal symptoms such as altered bowel habits, dyspepsia and visible blood in stool. Also ask about a family history of colorectal cancer, haematological disorders, e.g. thalassaemia, hereditary haemorrhagic telangiectasia and bleeding disorders. Hookworm infection is the most common cause of iron deficiency in developing nations,3 so this should be considered in people who have recently immigrated from, or spent time in, a developing country. For further information on testing for coeliac disease see: “The investigation of coeliac disease: a follow up”, BPJ 12 (Apr, 2008). N.B. In premenopausal females, do not exclude the possibility that iron deficiency may be due to causes other than menstruation. A diagnosis of anaemia of chronic disease does not rule out iron deficiency anaemia, and the possibility of iron deficiency should always be considered in people with chronic diseases causing anaemia. Does the patient have a chronic disease? In chronic inflammation, inflammatory cytokines inhibit iron transport by blocking iron from leaving macrophages and other cells important for iron trafficking. This results in a functional iron deficiency where iron is not made available by macrophages to developing RBC. Inflammatory cytokines also act to suppress erythropoietin secretion, compounding the inhibition of erythropoiesis. The anaemia associated with chronic heart failure is likely to be multi-factorial, with contributing factors including iron deficiency, chronic inflammation, renal disease and use of angiotensin converting enzyme (ACE) inhibitors or angiotensin-II receptor blockers (ARBs).13 ACE inhibitors are renoprotective, although they may contribute to anaemia of chronic kidney disease by blocking angiotensin II production and causing a reduction in circulating erythropoietin. In chronic kidney disease (CKD) there is inadequate erythropoietin production due to kidney damage and chronic inflammation, and RBC survival is shortened. For further information on CKD, see: “Managing anaemia of chronic kidney disease”. Serum ferritin provides the most useful indirect estimate of a person’s iron stores in both latent iron deficiency and iron deficiency with anaemia. Under normal conditions, there is a balance between iron absorption, iron transport and iron storage in the body. When a person’s iron stores are lowered or depleted they become iron deficient. Over time, iron deficiency can develop into anaemia if stores fall sufficiently low enough to affect erythropoiesis. See information on iron supplements, including doses. Total iron binding capacity (TIBC) is a measure of the maximum amount of iron the blood can carry. It is more or less equivalent to serum transferrin. It is normal or increased in people with iron deficiency and, because transferrin is a negative acute phase protein, it is generally decreased with chronic inflammation (Table 1).16 TIBC will usually be unchanged in people with thalassaemia or sideroblastic anaemia. Transferrin saturation is calculated from the serum iron and the iron binding capacity and gives a measure of iron trafficking and availability for erythropoiesis. It is not a measure of iron stores and will be normal or reduced in people with iron deficiency and acute or chronic inflammation (Table 1).16 Elevated fasting transferrin saturation may be an indication of iron loading, e.g. as seen in people with hereditary haemochromatosis. If iron deficiency and anaemia of chronic disease are ruled out as explanations for microcytic anaemia, a genetic disorder, such as thalassaemia, or more rarely sideroblastic anaemia, should be considered. The thalassaemias are a group of genetic disorders characterised by hypochromic microcytic red cells and ineffective erythropoiesis.10 They are caused by an imbalance in the synthesis of alpha and beta globin chains. The first-line management of iron deficiency anaemia is to prevent further blood loss by treating the underlying cause. Treatments that reduce menstrual loss should be considered in premenopausal women, e.g. hormonal contraceptives (including Mirena) or tranexamic acid. Consider stopping or reducing the dose of any medicine that may be contributing to blood loss. Review and correct any dietary factors that may be contributing to the anaemia, e.g. low dietary iron intake in people adhering to a vegan diet. Patients diagnosed with coeliac disease should begin a gluten free diet. Correction of depleted iron and other nutritional deficiencies with supplementary iron, vitamin B12, folate, calcium and vitamin D is often necessary.12 Referral to a dietitian experienced in managing coeliac disease is recommended to ensure nutritional adequacy and to provide detailed dietary education. For further information see: “Dietary advice for people with coeliac disease”, BPJ SE; Prescription Foods (May, 2011). For optimal iron absorption, supplements should be taken on an empty stomach. Gastrointestinal irritation can occur with oral iron, including nausea, epigastric pain and altered bowel function (constipation or diarrhoea).14 Patients should be advised to continue with their iron supplementation if symptoms arise, but to discuss these symptoms with their General Practitioner or Practice Nurse. If gastric symptoms occur, advise the patient to try taking the supplement with food. Increasing fibre and fluid intake can also be helpful for constipation. Alternate day dosing may be appropriate for some patients to reduce adverse effects. In patients receiving oral iron supplementation, the haemoglobin concentration should rise by approximately 1 g/L, per day, and should be approximately 20 g/L higher after three to four weeks.8, 14 Haemoglobin levels (FBC) should be checked periodically to assess response to treatment, particularly in the early stages if the patient has significant anaemia. Once levels return to normal, treatment should be continued for a further three months to replenish iron stores.14 Ferritin levels should be checked four to six weeks after completing treatment to confirm that iron stores have been replaced. Depending on the underlying condition, patients may be treated with blood transfusion, erythropoiesis-stimulating agents or with iron supplementation, occasionally parenteral iron.6 Erythropoiesis-stimulating agents are funded under Special Authority, and are only available for people with anaemia associated with CKD or with cancer being treated with chemotherapy. Iron infusion may be considered to treat iron deficiency anaemia in adults, if oral iron replacement is not tolerated, has not been effective or is not appropriate. Iron infusion is usually carried out in secondary care, however, some general practice clinics are now offering this treatment. Iron infusion is not recommended for women who are pregnant (especially in the first trimester), as there is no evidence to support its use or safety in pregnant women. Iron infusion should be undertaken with caution in people with an immune/inflammatory condition such as asthma, eczema or rheumatoid arthritis, as they may have a higher risk of allergic reaction.21 The patient must be closely monitored throughout the infusion to observe for adverse effects, especially allergic reaction. Resuscitation equipment and an anaphylaxis kit should be readily available in the clinic. For an IV infusion, the total dose of elemental iron should be 1500 mg for most patients. A lower dose (1000 mg) is recommended in elderly or frail people and people with mild anaemia (haemoglobin ≥ 100 g/L). A higher dose (2000 mg) is recommended for younger people, heavier people (≥ 70 kg) or people with more severe anaemia. Anaemia which develops in people with chronic kidney disease (CKD) is multi-factorial. The most significant cause is inadequate erythropoietin production. Erythropoietin is produced by peritubular capillary endothelial cells, and their ability to respond to anaemia is blunted in people with renal impairment. Iron deficiency is common in people with CKD, and inflammatory conditions also contribute to the anaemia. There is evidence that RBC survival is also shortened in people with CKD, possibly due to uraemic toxins, and haemoglobin levels may improve with adequate dialysis. Evaluation of anaemia in patients with renal failure is aimed at excluding causes other than erythropoietin deficiency, and should include a full blood count, serum ferritin and transferrin saturation. Reticulocyte haemoglobin content (CHr), which can be measured by most laboratories in New Zealand, is a further helpful parameter, as it gives an indication of iron availability to recently developed RBC and is therefore a measure of dynamic iron status. The treatment of anaemia of CKD focuses on the management of the underlying condition. Erythropoiesis-stimulating agents are subsidised for the treatment of anaemia associated with severe CKD where no cause for the anaemia is found other than kidney disease. Subsidy is subject to Special Authority approval. Depending on the individual patient and experience of the clinician, treatment may be managed in primary care. However, clinicians who are unsure about the use of erythropoietin and its possible complications should discuss the patient with a Nephrologist. Epoetin beta is indicated for the treatment of symptomatic anaemia associated with chronic kidney disease, and epoetin alpha is indicated for patients on haemodialysis. Typically, treatment is titrated to achieve a haemoglobin concentration of 100 – 120 g/L.23 For specific dosing information, refer to the New Zealand Formulary. There are many potential causes of normocytic anaemia and investigation can be more complex than for other types of anaemia. Acute blood loss is almost always obvious and significant haemolysis may cause jaundice and/or discolouration of the urine. Both of these conditions usually require emergency referral. Rarely, they may be present in an asymptomatic patient. A reticulocyte count should be requested to investigate whether the anaemia has arisen from decreased RBC production or increased RBC loss. If the body is unable to produce RBCs at a healthy rate, e.g. in a person with a bone marrow disorder, the reticulocyte count is often lowered, whereas when RBCs are being lost or destroyed, the reticulocyte count is increased. 25 A normal level of reticulocytes as a percentage of all RBCs in a healthy person is 1 – 2% (or 20 – 100 × 109 /L). Liver function tests (LFTs), serum creatinine and CRP should also be requested as they can provide further information to identify an underlying condition that may be suggested by the reticulocyte count. The primary causes of anaemia in patients with a low or normal reticulocyte count are normocytic anaemia of chronic inflammation, CKD and bone marrow disorders. Bone marrow disorders are usually associated with a low reticulocyte count. Bone marrow disorders are distinguishable from other normocytic anaemias by a low reticulocyte count, a reduction in RBCs and associated neutropenia or thrombocytopenia. 25 The patient’s blood film may also suggest bone marrow disease, e.g. dysplastic changes, or circulating nucleated red cells, immature myeloid cells or lymphoma cells. Specific bone marrow disorders, and the likely diagnosis, are usually indicated in the laboratory results. Patients with normocytic anaemia caused by blood loss or haemolytic anaemia should be referred for further investigation and treatment of the cause. The first step in managing a patient with normocytic anaemia of chronic disease is to identify and treat the underlying condition, which may resolve the anaemia. Alternatively anaemia may explained as a symptom of a previously identified condition, in which case it should be monitored, and if it worsens, treatment for the anaemia initiated.25 Depending on the underlying chronic disease/inflammation, this may involve blood transfusion, iron supplementation or erythropoiesis-stimulating agents (in chronic kidney disease). Macrocytic anaemia is defined as a MCV > 95 – 100 fL in a person with anaemia. Mature RBCs that are larger than normal, i.e. macrocytic, occur due to abnormalities in erythropoiesis, defects in DNA synthesis, changes in the structure of the cell membrane, alterations in cell fluid volume and other mechanisms that are not fully understood. Macrocytic anaemia can be further classified as megaloblastic or non-megaloblastic depending on the appearance of developing RBC in the bone marrow. Megaloblastic anaemia is characterised by developing RBC that are larger than normal with nuclei that are less mature than their surrounding cytoplasm.3 This occurs when DNA synthesis is defective and slower than the rate of development of the rest of the cell. Megaloblastic anaemia can also be identified by the presence of neutrophils on blood film with hypersegmented nuclei (six or more lobes).3 Vitamin B12 or folate deficiency are the usual causes of megaloblastic anaemia. In non-megaloblastic anaemia, DNA synthesis is not affected and the developing RBC in the bone marrow appear normal. Alcohol, liver disease and myelodysplasia are some of the causes of non-megaloblastic anaemia. Macrocytic RBC can occur with or without anaemia (see: “Macrocytosis without anaemia”). Table 3 lists the main causes of macroytosis. Alcohol misuse should always be considered in patients with macrocytic anaemia.3 Even relatively moderate quantities of alcohol can cause macrocytosis, e.g. consumption of two gin and tonics, or approximately half a bottle of wine per day, especially in females.3 The mechanism(s) for this effect is uncertain, however, alcohol consumption is thought to increase lipid deposition into RBC membranes making RBCs larger. Direct toxicity of alcohol on the bone marrow is also likely to contribute. Vitamin B12 and folate deficiency are the most likely causes of megaloblastic macrocytic anaemia. This is because vitamin B12 (cobalamin) and folate are both co-factors for DNA synthesis.27 A number of conditions affecting the gastrointestinal tract can result in vitamin B12 and folate deficiency, such as coeliac disease, inflammatory bowel disease and Crohn’s disease. Long-term alcoholism is also commonly associated with vitamin B12 and folate deficiency.2, 3 A normal diet will usually provide sufficient vitamin B12 and folate, however, people eating a vegan diet, people who are malnourished or older people may be at risk of dietary deficiency.3 Other risk factors for vitamin B12 and folate deficiency include low socioeconomic status, previous gastric surgery (although most patients will be taking vitamin B12 and folate supplements) and the use of medicines such as trimethoprim and phenytoin. Clinical examination may reveal signs of an underlying condition, e.g. chronic liver disease, hypothyroidism or disease causing malabsorption. Macrocytosis may be physiological, e.g. during periods of high cell turn-over. Women who are pregnant can have macrocytosis associated with the anaemia of pregnancy and the increased demand for folate. Macrocytosis is also commonly associated with alcoholism (also see Table 3 for other causes). Investigate for pernicious anaemia in patients with low serum vitamin B12 levels. This can be tested for by requesting antiparietal cell antibodies or intrinsic factor antibodies.3 Parietal cell antibodies are present in 90%, and intrinsic factor antibodies in 50%, of people with pernicious anaemia.3 Pernicious anaemia is associated with the autoimmune destruction of gastric parietal cells that secrete intrinsic factor, which facilitates the uptake of vitamin B12. Pernicious anaemia can be treated in primary care as a vitamin B12 deficiency, but if there is neurological involvement, the patient should be discussed with a Clinical Haematologist. Gamma glutamyl transferase (GGT) is the liver enzyme most often raised in people who consume excessive amounts of alcohol. Typically this will be elevated in the range of 60 – 200 U/L, but rarely can be as high as 1000 U/L.32 Aspartate amino transferase (AST) and alanine amino transferase (ALT) may also be elevated (upper reference range 45 U/L).32 If the AST/ALT ratio is > 2, consider alcoholic hepatitis, especially if there is also raised GGT. Macrocytosis due to alcohol misuse usually resolves with abstinence from alcohol after a period of time. For further information see: “Management of thyroid dysfunction in adults”, BPJ 33 (Dec, 2010). If LFTs, TSH and kidney function are normal and other causes have been eliminated, consider the possibility that the macrocytic anaemia is caused by haemolysis. Haemolysis can be investigated by requesting a reticulocyte count. An increased number of reticulocytes suggests haemorrhage or haemolysis and may explain a mildly elevated MCV.34 Also see: “Normocytic anaemia”. N.B. Acute blood loss, e.g. from recent child birth or trauma, can result in a mildly elevated MCV due to more reticulocytes being present in the circulation as lost RBCs are replaced.3 Reticulocytes are larger than mature RBCs and therefore can cause a transitory elevation in the MCV while the body replaces lost RBC. If other investigations have not revealed a possible cause for macrocytic anaemia, then the suspicion of malignancy should be increased, particularly in older patients. There are also a number of rare hereditary conditions causing defects in DNA synthesis that can result in megaloblastic anaemia.3 These usually present in infancy. Paraproteins, e.g. multiple myeloma, can cause an increase in MCV without macrocytes being present on the blood film.3 Suspicion of multiple myeloma should be increased in patients aged over 60 years with any bone pain, and fatigue and/or weight loss, renal impairment, with or without hypercalcaemia.35 A practical approach to investigating the possibility of multiple myeloma is to request serum protein electrophoresis and then to discuss the result with a Haematologist if an increase in immunoglobulins is found. A bone marrow aspirate is generally required to confirm a diagnosis of multiple myeloma. Thank you to Dr Edward Theakston, Haematologist, Auckland DHB, Clinical Director, Haematology, Diagnostic Medlab, Auckland and Dr Paul Ockelford, Clinical Haematologist, Auckland DHB, Director of Clinical Services Diagnostic Medlab, Auckland for expert review of this article. Ministry of Health. Pharmaceutical Collection. MOH: Wellington, New Zealand; 2013. Murtagh J, Rosenblatt J. Murtagh’s General Practice. 5th ed. McGraw-Hill Australia Pty Ltd; 2011. Provan D. ABC of Clinical haematology. 3rd ed. Oxford: Blackwell Publishing; 2007. Goddard A, James M, McIntyre A, et al. Guidelines for the management of iron deficiency anaemia. Gut. 2011;60:1309–16. Longo D, Fauci A, Kasper D, et al. Harrison’s principles of internal medicine. 18th ed. New York: Mc Graw Hill Medical; 2012. Cullis J. Diagnosis and managment of anaemia of chronic disease: current status. Brit J Haematol. 2011;154(3):289–300. British Committee for Standards in Haematology (BCSH). UK guidelines on the management of iron deficiency in pregnancy. London: BCSH; 2011. Available from: www.bcshguidelines.com (Accessed Aug, 2013). National Institute for Health and Care Excellence (NICE). Clinical Knowledge Summaries. Anaemia - iron deficiency. NICE; 2013. Available from: http://cks.nice.org.uk (Accessed Aug, 2013). Zakherah M, Sayed G, El-Nashar S, Shaaban M. Pictorial blood loss assessment chart in the evaluation of heavy menstrual bleeding: diagnostic accuracy compared to alkaline hematin. Gynecol Obstet Invest. 2011;71(4):281–4. Uprichard W, Uprichard J. Investigating microcytic anaemia. BMJ. 2013;346:f3154. Jones R. Easily Missed? Coeliac disease. BMJ. 2009;338:a3058. Coeliac Australia. Coeliac disease. 2011. Available from: www.coeliac.org.au (Accessed Aug, 2013). Taliercio J. Anemia and chronic kidney disease: What’s the connection? J Fam Pract. 2010;59(1):14–8. New Zealand Formulary (NZF). NZF; 2013. Available from: www.nzf.org.nz (Accessed Aug, 2013). Berlin T, Meyer A, Rotman-Pikielny P. Soluble transferrin receptor as a diagnostic laboratory test for detection of iron deficiency anaemia in hospitalized patients with acute illness. Isr Med Assoc J. 2011;13:96–8. Van Vranken M. Evaluation of microcytosis. Am Fam Physician. 2010;82(9):1117–22. Pennell DJ, Udelson JE, Arai AE, et al. Cardiovascular function and treatment in β-thalassemia major: A consensus statement from the american heart association. Circulation. 2013;128(3):281–308. Harteveld C, Higgs D. a-thalassaemia. Orphanet J Rare Dis. 2010;5(13). Hill A, Bowden D, Trent R, et al. Melanesians and Polynesians share a unique alpha-thalassemia mutation. Am J Hum Genet. 1985;37:571–80. Camaschella C. Recent advances in the understanding of inherited sideroblastic anaemia. Brit J Haematol. 2008;143(1):27–38. European Medicines Agency. New recommendations to manage risk of allergic reactions with intravenous iron-containing medicines. London: European Medicines Agency; 2013. Available from: www.ema.europa.eu (Accessed Aug, 2013). Garg M, Morrison G, Friedman A, et al. A rapid infusion protocol is safe for total dose iron polymaltose: time for change. Intern Med J. 2011;41(7):548–54. National Institute for Health and Clinical Excellence (NICE). Anaemia management in people with chronic kidney disease. United Kingdom: NICE; 2011. Available from: www.nice.org.uk (Accessed Aug, 2013). Lankhorst C, Wish J. Anemia in renal disease: diagnosis and management. Blood Rev. 2010;24:39–47. Wall M, Street A, Pokorny C. Investigating normocytic normochromatic anaemia in adults. Medicine Today. 2006;7(3):43–7. Brill J, Baumgardner D. Normocytic anaemia. Am Fam Physician. 2000;62(10):2255–63. Aslinia F, Mazza J, Yale S. Megaloblastic anaemia and other causes of macrocytosis. Clin Med Res. 2006;4(3):236–41. National Cancer Institute. General information about myelodysplastic syndromes. 2013; Available from: www.cancer.gov (Accessed Aug, 2013). New Zealand Nutrition Foundation. B vitamins and folate. 2009. Available from: www.nutritionfoundation.org.nz (Accessed Aug, 2013). Ministry of Health. Folate/folic acid. 2010; Available from: www.health.govt.nz (Accessed Aug, 2013). McDermott MT. In the clinic. Hypothyroidism. Ann Intern Med. 2009;151(11):ITC61. Kaferle J, Strzoda CE. Evaluation of macrocytosis. Am Fam Physician. 2009 1;79(3):203–8. Hsu DC, Wilkenfeld P, Joshua DE. Multiple myeloma. BMJ. 2012;344:d7953. Angus Wong said: 13/02/2014 6:50:51 p.m. The article mentions iron infusion is appropriate when oral replacement is not tolerated, not effective or not appropriate and it is offered in some general practice. When is oral supplement "inappropriate"? I wonder if BPAC can give some guidance on when a GP should initiate iron infusion given that it is still generally recommended by specialist in my experience. bpacnz clinical team says: Iron infusion is usually carried out in secondary care, but increasingly, general practices who have the resources to carry this out, are offering this treatment. Iron infusion may be considered in adults with iron deficiency anaemia if oral treatment is not successful because the patient cannot tolerate the adverse effects (predominantly gastrointestinal) or if the patient is not concordant with treatment, i.e. they are not reliably taking oral medication. It may also be considered in patients with continuing blood loss or malabsoprtion. Patients with chronic renal failure who are receiving haemodialysis also require intravenous iron administration. The Editor said: 26/02/2014 11:20:43 a.m.
Iron infusion is usually carried out in secondary care, but increasingly, general practices who have the resources to carry this out, are offering this treatment. Iron infusion may be considered in adults with iron deficiency anaemia if oral treatment is not successful because the patient cannot tolerate the adverse effects (predominantly gastrointestinal) or if the patient is not concordant with treatment, i.e. they are not reliably taking oral medication. It may also be considered in patients with continuing blood loss or malabsoprtion. Patients with chronic renal failure who are receiving haemodialysis also require intravenous iron administration. Eli Leckey said: 6/11/2016 7:57:51 p.m. This article is 5 years and 7 months old.